Omillar Johnson Harris was born August 7, 1921 in Love County, in a small community west of Marietta. Her parents were Hilary and Obie (Daily) Johnson. Omillar Johnson and Samuel E. Harris were united in matrimony in 1937. Four children were born to this union. She was preceded in death by her parents, an infant son, four sisters, and one brother. Mother is survived by two daughters: Sandra L. Brown of Watonga, OK, Delores J. Gilmore (Paul) of Bakersfield, CA; one son: Samuel E. Harris, Jr. (Mae) of Albuquerque, NM; adopted daughters: Troyce Tate, Oklahoma City, OK, and Janet Reinwald (John), Louisville, KY. Four granddaughters: Keretia Haddix (Felix), TaWanna Haswell (Ashton), Nichole Simpson (Marcel), and Akeisha Boyd; four grandsons: Craig Reece (Alecia), Sean Harris (Sharron), Theodore Boyd (Christina), and Don Harper (Rhonda); and eleven great grandchildren; and one brother-in-law, Frank Harris (Pauline), Los Angeles, CA. She was loved by many nieces (Thelma Walker, Watonga, OK, and Ethel Youngblood (Bill), Bakersfield, CA), nephews, and friends to whom she was affectionately known as Aunt Dank or Mother. September 11, 2011, she received an award for "Years of Dedicated Service" at Union Baptist. She worked as an Election Official for many years. 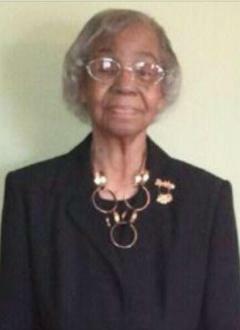 She was an active member of the Eastern Star, Rose of Sharon Chapter, as well as the Heroines of Jericho. She was a 40-Year Member of the Watonga Hospital Auxiliary. She was instrumental in organizing the Watonga Community Reunion in 1977, and continued to be involved. In 2010, she received an award from the Watonga Community Reunion, "Outstanding Service to the Community of Watonga." In 2012 she was the Grand Marshal of the Watonga Community Parade. She volunteered for the Retired Senior Volunteer Program (RSVP) for 18 years. In 2008, Omillar received the Amy Yount Award from the RSVP. Because she wanted to make a difference, she volunteered for many other civic organizations. Mother loved baking her specialties for family and friends, which were her apple, and peach cobblers, pecan pies, seven-up, and cream cheese pound cakes. She also enjoyed reading, doing crossword puzzles, and traveling with her Sister Veola (before she passed). Over the years, she has traveled extensively with her kids, grandkids, and her church family. I love my granny and will miss her. I will always cherish the times that I spend with her and the talks we had. Thank you granny for being you. You were one in a million. You will will always live in my heart. Sunday school, Bible study and church will never be the same without my aunt Dank. I love and miss her so very much. We are so sorry to hear of your mother's passing. We pray that you will take comfort in knowing that she is with our Lord and you will see her again. You and your family are in our thoughts and our prayers. I will dearly miss my Aunt Dank she was an inspiration in my life love you Aunt Dank you will truly be missed. Mother...gone from this world but, never forgotten. Now living the good life on the other side. I know their gonna love your peach cobbler!